Jamie Seymour is hunting shadows. Box jellyfish--some of the most terrifying animals on the planet--are completely invisible in water, so the best Seymour can hope to find are the shadows they project onto the shallow ocean floor. He keeps a stealthy eye out for flashes of shadows on the sand beneath his boat just a few feet off the northern Australian coastline. When he thinks he's spotted something, he tosses a large plastic bin overboard in hopes of pinning his prey. Clad in thick rubber armor to protect himself from the box jelly, Seymour hops out of the boat to investigate his catch. The box jellyfish inside the bin is roughly the size of a squared-off basketball. Though it is called a jellyfish and looks much like one, it is technically a member of a slightly different species. Chironex fleckeri has a startling 24 eyes, six facing each direction. On its base are 60 tentacles roughly eight feet long that bear a striking resemblance to fettuccine. Creeped out yet? If not, here's the final nail in the coffin: These animals can kill a human in about two minutes, and we don't entirely know how. Not to mention that a box jellyfish sting is probably among the most painful ways to die. 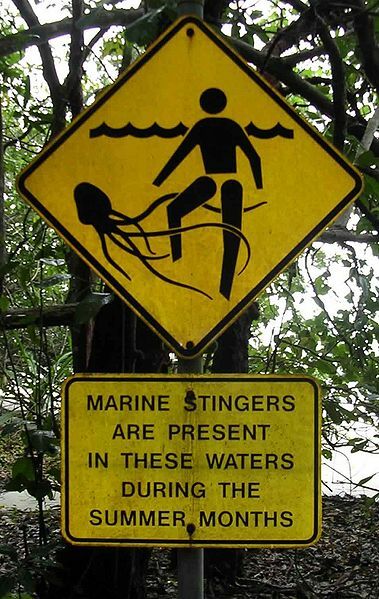 A signpost at a beach in Cape Tribulation, Queensland, Australia warning of the presence of the box jellyfish Chironex fleckeri and others. Image courtesy TydeNet, licensed under Creative Commons. Seymour is a professor of biology at James Cook University in Australia, and has spent much of his professional life studying and tracking box jellies. He's devised a way to follow these animals by capturing them in his plastic bins and using surgical glue to attach small tracking devices to their skin. The glue only lasts a few days, but it's enough time to make some startling discoveries. Among the first surprises: Box jellies are fast. They can swim at speeds up to four and a half knots--that's just under the speed of an Olympic swimmer. When they swim, their tentacles shrink from as long as ten feet to as short as two feet to help reduce resistance. In other words, unless you're Michael Phelps, don't count on being able to outrun one of these guys. Even more shocking than their speed is when box jellies stop all together. Sleep is extremely unusual in invertebrates, especially ones that are composed of 96% water. Seymour's colleagues went so far as to call him nuts when he proposed the idea that box jellies sleep, but the data is clear: Box jellies sink to the bottom of the ocean and snooze whenever it's dark outside. Why is this significant? First and foremost, it gives the box jellies a chance to hide from their turtle predators, who are lucky enough to be one of the few creatures immune to box jellyfish venom. But it also gives them a chance to grow. Box jellies grow about two to three millimeters every single night, putting on layers like a tree. Their metabolisms have to run like V8 engines to fuel that kind of growth, so sleep gives them a chance to sit still while they expand in size. But there are a few big gaps in what scientists know about box jellies. We know their venom can kill humans faster than any other animal's, but we still don't know exactly what's in it. There's certainly a cardiac component that does not allow the heart to re-expand after it's contracted (this is what kills you) and a component that destroys your tissues (this is what causes such extraordinary pain). But aside from the basics, there's a lot of work to be done on what makes the venom so powerful. And remember those creepy 24 eyes? Box jellies use them to track and hunt their prey, but they do it without any kind of centralized brain. For neuroscientists, this is an enormous puzzle. Anyone observing a box jellyfish in the wild corralling fish and isolating the one it wants to attack would say it's obvious that it can process complex visual information, but how is this possible without a brain? The answer just may revolutionize how we think about brains and visual information. Box jellies have killed at least 67 people in Australia since records began in 1883. Related but not-quite-as-deadly species can also be found in Hawaii, where they injure surfers and waders every year. To avoid being the next victim, Seymour and others suggest following advisory signs to keep off the beaches during box jelly mating season. That is, unless you're equipped with a boat, rubber armor, plastic bins, and some serious guts, in which case you might be a good addition to Seymour's team. This is the second installment of The Venom Chronicles, a blog series by Hannah Krakauer, a research intern at NOVA and a student at Stanford University. From more on the science of venom, watch Venom: Nature's Killer, premiering Wednesday, February 23 at 9pm on most PBS stations. I think its worth noting a couple of things. This article portrays jellyfish as somehow wanting to chase human beings. That's patently absurd. What would a jellyfish do with a human being if it 'caught' one? Saying you couldn't outrun a jellyfish if it was chasing you is like saying you couldn't outrun any hawk or a gazelle. That is to say its true but meaningless, since there's no reason that they'd be chasing you. The woman in the television episode who's killing jellyfish in an attempt to create a block for their venom was similarly portrayed as having been 'struck' by a jellyfish. What actually happened is that she struck the jelly. She swam into it. That isn't to say that her work isn't important. But lets not be silly in our depiction of what are basically innocuous creatures for humans in the same way a brick wall is innocuous unless you drive straight into it. 24 eyes,60 tentacles roughly eight feet long, and no brain? What an amazing creature!! I bet it would make to one of the SiFi movies one day. Good job, Brovo! !